From the Internet Explorer Browser select Tools from the menu bar. 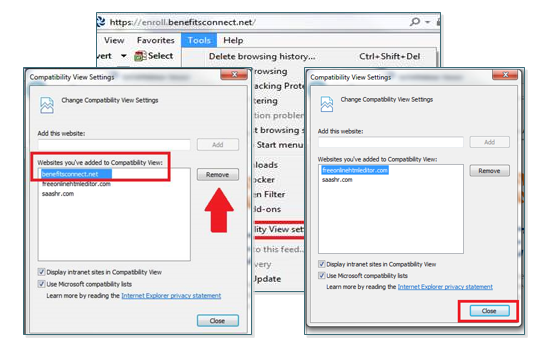 Once you selected Tools select the Compatibility View Settings. Once you’ve selected Compatibility View settings a new screen will open. In the new screen, you will want to click on benefitsCONNECT.net listing, after you have selected the appropriate listing and it is highlighted please click Remove. After you have removed the site, it will no longer be illustrated in the Compatibility View websites. Click Close to continue and proceed to login to bCEnroll.